This extension of the COMET module “GOES-R: Benefits of Next Generation Environmental Monitoring” focuses on the Geostationary Lightning Mapper (GLM) instrument, the satellite's lightning mapper. The GLM will provide continuous lightning measurements over a large portion of the Western Hemisphere, mapping total lightning (intra-cloud and cloud–to–ground) flash rates and trends. GLM observations will improve local forecasts and warnings of severe weather and air quality, and provide new data for numerical weather prediction and studies of regional climate and climate change. 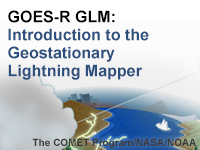 The first part of the lesson describes the need for real-time lightning information and introduces the capabilities of the GLM, which will fly on the next-generation GOES-R satellites. The second section lets users explore the life cycle of a typical cloud-to-ground lightning flash, how it is observed by space and ground-based detection systems, and how lightning flashes translate into GLM observations. The final section explores some of the many applications that will benefit from GLM observations including convection and severe weather nowcasting, warning of lightning ground strike hazards, aviation, atmospheric chemistry, quantitative precipitation estimation, tropical cyclones, fire ignitions, numerical weather prediction, and climate and global studies. A quantum leap for me in my understanding of lightning and the available tools to use it in forecasting. A solid introduction to the many applications that this data may provide. Some animations would not run. Lot of reading required which details can be lost if not provided in a audio or visual presentation. There was a lot of good information in this lesson. This non-meteorologist came away with what I consider to be a basic understanding of the GLM. Good for learning more about how GLM works and what products will be available. Excellent overview of the GLM and its broad implications for meteorology, climatology, and safety. Excellent overview of GOES-R capabilities and contributions to the advancement of weather forecasting. Excellent tutorial on lightning also. Very useful, clearly written and presented package. Not too scientific, but not too general either. Highly recommended for anyone who wants to learn more about lightning (not only GLM) and is not already deeply involved with the related science and/or technology. 2016-05-04: HTML and media assets in this lesson have been updated for current browsers and mobile devices.